Do you struggle with finding time to spend with God? A moment to really find peace and quiet to read and speak through prayer. Prayer is such and important part of our faith and as a mom of young children it can seem almost impossible to find quite time to pray. When my kids were little and I was a new Christian, I had the desire to spend time with the Lord, but it just seemed like something always came up to distract me. Before I knew, the day was over and I failed once again to have my Quiet time with the Lord. I was beat and I would crawl into my bed, start saying my prayers, and fall asleep. Now, I guess falling asleep while praying is a peaceful way to fall asleep, but it does not do much for a better prayer life. I knew God loved me and wanted me to spend time with Him daily, and, I wanted to. I am not sure exactly what made me decide to do something different, whether it was a sermon, or a Sunday school lesson or just someone making a suggestion, but my prayer life changed. I started by praying a prayer and making a commitment to God that I would not go to bed without first getting on my knees and praying. I asked God to give me more of a hunger for Him. Q Quite place – Find a place in your home where you can open your bible and pray. kids, spouse, cell phone or television. options. Ask God to speak to you. Listen for Him to speak through a verse. E Empty yourself – Ask God to reveal to you anything which displeases Him. down your prayer requests and the scripture you read, and how it spoke to you. T Talk to God – God already knows what you are thinking, and your circumstances. Pour your heart out to Him, ask Him to answer, help, forgive and change you. will always be praying God’s will when you are praying God’s Word. children, love, joy. It will lead you to a scripture, which speaks to that subject. your circumstances but it will change you. I prayed this prayer 18 years ago. It changed my life as a follower of Christ. Consistency has not always been easy and now I do my Quiet Time first thing in the morning. It is not about when or what time you have your time alone with the Lord, it is about the commitment. God desires to spend time with you. When you love someone, you want to spend time with that person. I read today, “Can you imagine talking with your spouse or child once a week? ” We want to spend more time then that with them and God is no different, He wants more time with you then once a week. When we spend time with our Heavenly Father, we fall more deeply in love Him! Hear __________ as she/he prays, O Lord. Be merciful and answer _____________! 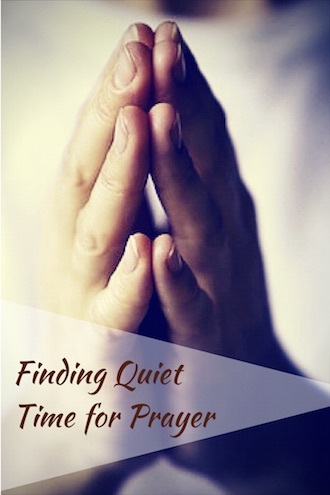 Please leave a comment with something you do, which others might find helpful for having a better Quiet Time. Or if this has encouraged you in anyway, please let us know. You just helped me out find a right and peaceful time to pray, thank you. I have been a busy mom with 2 kids to take care and sometimes, praying gets so hard to do. You opened me up to how to do things right and how to focus when I pray. Thank you. Thank you so much for this post. It has given me some ideas on how to improve my prayer life. I am looking forward to putting these into practice. Thank you and have a good day. Good post. Practical idea. God waits for us to spend time with him. And what a difference it makes in our days. And if someone is not convinced. Just start doing it and you’ll see. I haven’t had quality quiet time in a while. I can tell too. I’m anxious, depressed and just snappy. The difference that even just 15 minutes a day makes is astounding. Start with just a few extra minutes a day. Read a verse or a devotion with a verse and ask God how you can apply it your life. Then wait and listen to what comes into your mind and spirit. God will tell you. Then pray and ask God to help you apply it to your life. Sometimes, we may not like everything we hear, but try doing this every day and you will start finding hope and strength. One day at a time. 21 days and it will be a habit. A much needed and good one, at that. Thanks for allowing me to share my heart and this post on your site! Have a wonderful day! Thanks Anne. He is waiting. My time with the Lord is my favorite time of the day. It has made a huge difference in my life and changed the way I think about things. God as brought so much joy and peace into my life, even through the hard times. Thanks for your comments.